The single fastest-growing religious group of our time is those who check the box next to the word none on national surveys. In America, this is 20 percent of the population. And most churches are doing virtually nothing to reach them. In this hard-hitting examination of our churches' current evangelism methods, which often result only in transfer growth; Christians moving from one church to another, rather than in reaching the 'nones', James Emery White calls us to discover the mission field right outside our doors. Exactly who are the unaffiliated? What caused this seismic shift in our culture? How can our churches reach these people? If you long to see growth in your church that is the result of lost people entering into the family of God, this book is where you should start. The Rise of the Nones by James Emery White was published by Baker in June 2014 and is our 30587th best seller. The ISBN for The Rise of the Nones is 9780801016233. 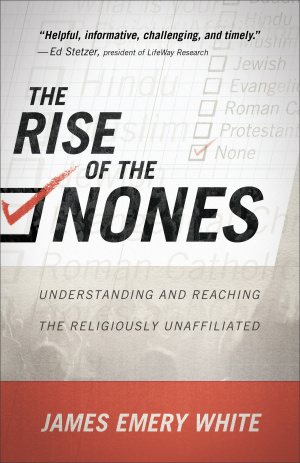 Be the first to review The Rise of the Nones! Got a question? No problem! Just click here to ask us about The Rise of the Nones. "In an era of increasing complexity and religious apathy, James Emery White has written a book that is helpful, informative, challenging, and timely. Those who care about communicating the gospel in this complex culture and think the church must regroup and re-engage should read The Rise of the Nones." - Ed Stetzer, president of LifeWay Research. James Emery White (PhD, Southern Seminary) is the founding and senior pastor of Mecklenburg Community Church, a suburban megachuch in Charlotte, North Carolina, often cited as one of the fastest-growing church starts in the United States. Former president of Gordon-Conwell Theological Seminary, White is the author of several books, including Rethinking the Church, What They Didn't Teach You in Seminary, and The Church in an Age of Crisis. He lives in North Carolina.